Here is the other result of the Dahlia sewalong! This dress is Version 1. 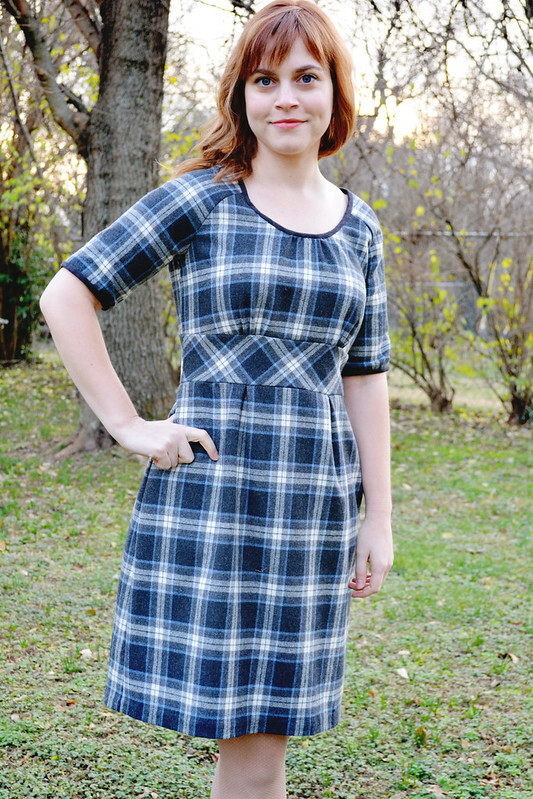 Like nearly everyone else, after seeing the gorgeous model pictures for the pattern release, I couldn't bear to make it out of anything other than plaid. 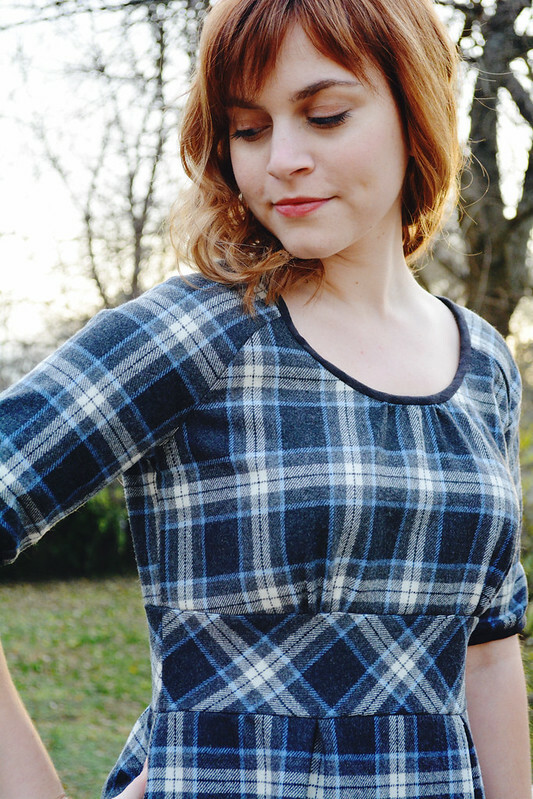 The fabric is this Italian wool flannel from Mood. I thought it was on the border of being too thick to work with the gathers, but I loved how it looked and felt so I followed my usual methodology and just went with it. 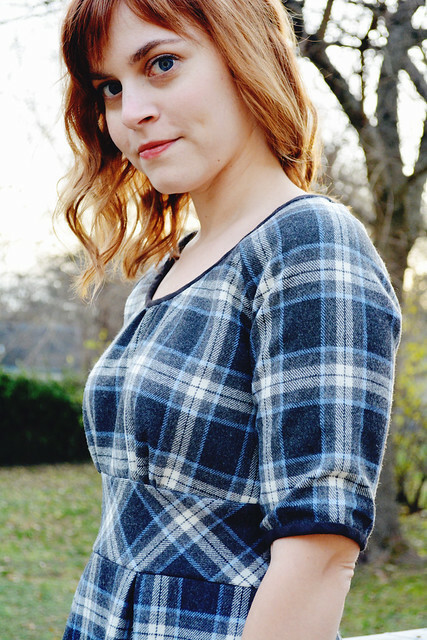 This is actually the first real wool garment that I can remember owning, except for a pea coat from the Gap that has been tentatively carbon dated to the High School Era and possibly an ill-fated sweater that found its way into the dryer. I mostly don't have wool because of where I lived, and I also don't lead a dry-clean-only lifestyle. Plus, wool sends some mixed signals. It feels all soft in your hands, and then you put it on your body and it's like, HA! tricked you, I'm actually gonna BE ALL SCRATCHY. It keeps you warm when it's wet, yet you can't wash it. And the smell of damp wool fills me with conflict - I think it's kind of gross, but it also makes feel vaguely pleasant? All that being said, I've decided I do like to wear wool, and I'd like more wool things. So let's talk about fit. When I first made my muslin, I cut a 2-4-6 based on my 33-27-38 measurements. Everything was pretty ok, except the shoulders were way too big. Like falling off too big. If you look at the original sample pictures, it's quite a wide scoop neck on the model, and as I've said with annoying frequency, I have pretty narrow shoulders. I decided that I didn't just want to do a fit adjustment - as in, adjust it to look proportionately the same as it does on the model. Instead I wanted to redraw the neckline so that it was a bit higher up. That way I'd be sure it would stay up and there would be no peeking bra straps [a major pet peeve of mine]. On the sleeve, I did a couple of things. First, while wearing my muslin, I decided how much further in I wanted the neckline to be at the front raglan seam - I think it was 1.5". I extended the front raglan edge towards my neck by that amount. I also angled it slightly to shave off a bit from the width of the sleeve at the neckline because it was kind of gapey. The amount I angled it was determined by how much I pinched on the muslin. 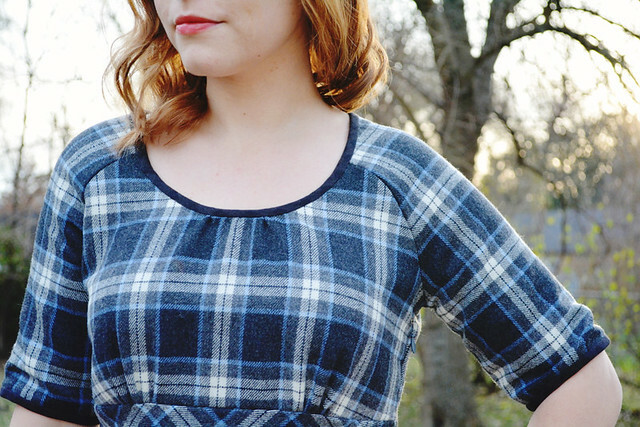 On the front bodice, I lengthened the raglan edge by the same amount. I also angled it because it was hitting me too high, and also to take out some of the neckline circumference. The yoke and skirt fit fine, although I think I could have cut a 4 in the skirt instead of going out to a 6, but with the lining and the zipper and everything I'm not changing it! Speaking of lining - I added a sleek and shimmery Bemberg rayon lining to deal with the aforementioned wooly itch factor. Cliff notes version is that I made a whole second dress out of the lining, attached it at the zipper, and stuffed it to the inside. The process is detailed further [and with pictures] in this sewalong post if you want to learn more. 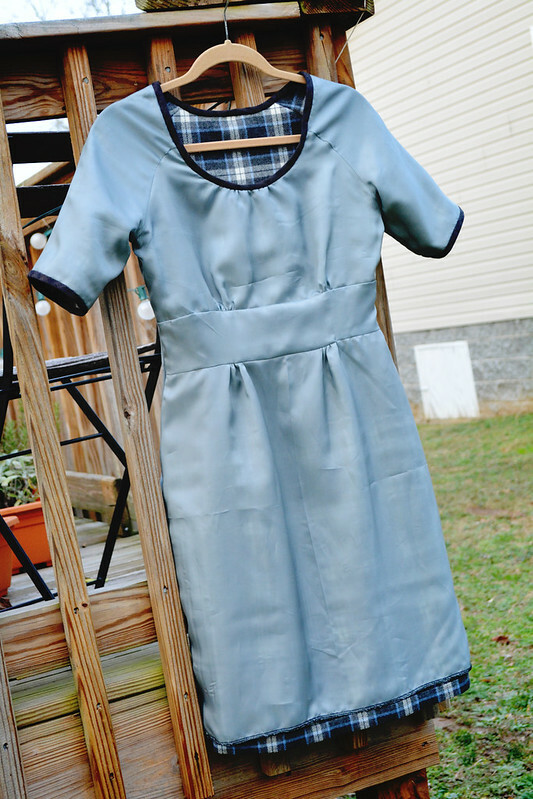 Other sewing notes - after finishing the dress, I decided that I'd rather have the skirt be pleated rather than gathered. 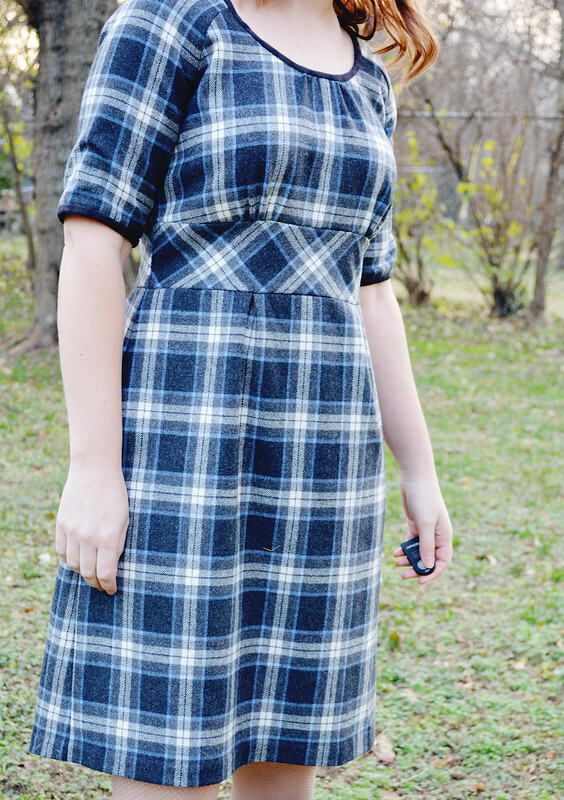 With the thicker fabric and the plaid I just thought it might look a little cleaner. It was a really quick alteration, just a matter of undoing the yoke seam where the gathers were, squeezing out a box pleat and restitching that section. Since I had a separate lining, I omitted the inner yoke, meaning all those seams were still exposed and accessible. I think the last thing to mention is I made the bias tape 3/8" finished instead of 1/4" to account for the thicker fabric. I'm very satisfied with how this turned out, although because of the dry clean factor I probably won't wear it as often as I would if it were machine washable. Or, I will just have to expedite my acquisition of more wool things to make the trip worthwhile. I did have a dream about ponchos the other night... [not kidding].